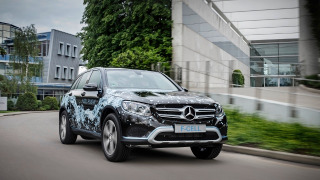 Based on the conventionally-powered GLC, the car is a result of Daimler developing a fuel cell system which can fit into a conventional engine compartment. It’s 30% more compact and uses 90% less platinum in its construction, which reduces costs. Hydrogen is stored in a pair of carbon fibre encased tanks, which can store 4kg of the gas at 700-bar – the higher-pressure standard, which enables more ‘fuel’ to be stored on board. Refuelling takes around three minutes, and offers a range of 280 miles. Otherwise, it functions much like the brand’s other plug-in hybrids. There’s a 9kWh lithium-ion battery on board, which offers a range of 31 miles to a full charge. The GLC F-CELL will be produced alongside the rest of the model range at the plant in Bremen, which manufactures the petrol-electric plug-in hybrid GLC 350 e.
UK sales have not been confirmed yet, but are likely.